Aquamarine is a blue to green-blue variety of precious beryl. The beryl group of minerals is most famous for chromium-rich, green emerald, which happens to be one of the ‘Precious Four’ gems of the world (diamond, sapphire and ruby are the remaining three). 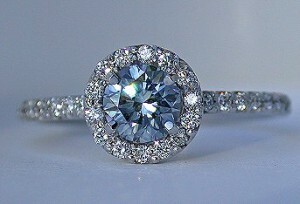 Aquamarine is the official birthstone for those born in March. Aquamarine is exceptionally hard and has an outstanding glass-like luster. It is most famous for its breathtaking sea-blue colors which can range from light blue to dark blue. The name ‘Aquamarine’ was derived from an old Latin expression which meant ‘seawater’. NYC Wholesale Diamonds offers a magnificent collection of Aquamarine and Diamond Rings, Tennis Bracelets, Necklaces, and Earrings. We caution you to always request a certified appraisal when purchasing Aquamarine Jewelry. The more common Blue Topaz can be quite similar in appearance and is not a rare gemstone.